I submit most of my social media items through Buffer. Buffer makes it very easy to post a single item to Twitter, Facebook, and ADN simultaneously. Once posted, Buffer keeps basic statistics for how each submission on each of the networks. The figure below shows statistics for yesterday’s tweets. My tweets for Muslim women responding to Femen protests and my own blog post on the protests gathered a combined 291 clicks and 24 retweets. 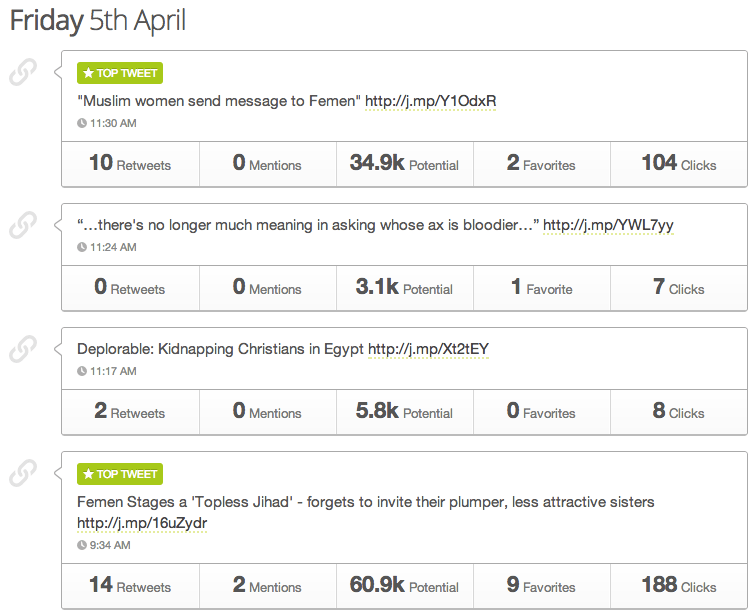 The post deploring kidnapping Egyptian Christians gathered 8 clicks and 2 retweets. These numbers indicate, of the people who actually saw the tweet, how many found the tweet’s description of its accompanying link interesting enough to click through to the full story; and how many found the description or story interesting enough to share it with others. There is an obvious disparity between the interest in the Femen-related tweets and the kidnapping tweet. One possible explanation for the disparity is that the Femen tweets were easier to find due to their hash tags (while the kidnapping tweet did not), though the statistics for Facebook – which does not use hash tags – show similar disparities. Moral of the story: Egyptian Christian kidnapping victims need to hire their own cadre of bare-breasted European activists with the right body image to protest on their behalf.